Interpine #UAV / #Drone and Harvesting Performance Systems team part of the field day showing recent advances in the harvesting technology being used and deployed into our #forest industry in New Zealand. This is coverage from #TVNZ One News reviewing the technology on show, including our UAV / Drones. 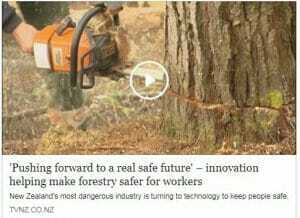 Tree harvesting machines which can operate on steep forty-five degree slopes are being shown off in #Rotorua today.